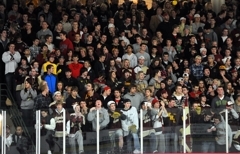 With the Maple Grove student section in postseason form on Wednesday night in hopes of giving its team a mental edge while getting into Greyhounds’ goalie Dylan Parker’s head, the junior netminder admitted that he barely paid notice to the boisterous, hostile environment at the Maple Grove Community Center. Goaltenders that step into the crease in road buildings have been known to struggle with a vocal home crowd. Often they lose focus, they don’t stop the shots they should and they let the momentum build against them. Just ask Roberto Luongo what it’s like to stand between the pipes in those situations. But Parker was a brick wall against the No. 2-ranked Crimson, allowing absolutely nothing after Maple Grove found a way to tie the game at one midway through the opening period. Because of his mild manner and fundamentals, Parker didn’t have to make any sprawling, game-changing saves. Instead, he stood at the top of his crease and swallowed up shot after shot, holding up his end of the deal to near perfection. The power play that Maple Grove found itself on towards the end of the second period was maybe Parker’s best showing all game. He stopped several point-blank chances, he found pucks through traffic and, most importantly, snuffed out any momentum the Crimson hoped to gain from the man advantage. 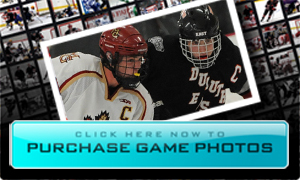 Duluth East’s 4-1 victory over Maple Grove was an exciting game to catch in person – although many fans probably missed some of it craning their necks to catch the action. 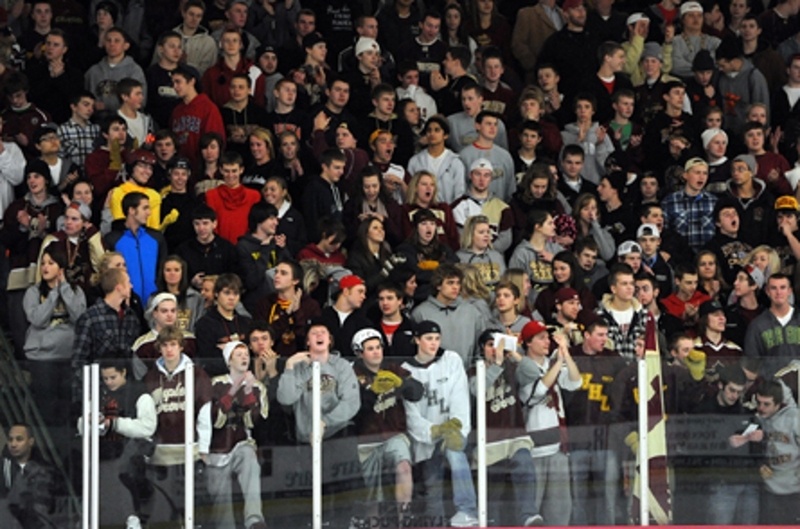 The Maple Grove Community Center was packed to the brim for the matchup between the No. 1-ranked Greyhounds and the No. 2 Crimson, creating an electric atmosphere that added to the intensity of the game. An estimated 1,500 people crammed around the rink, even lining the boards with four rows of people in some places and blocking stairways. 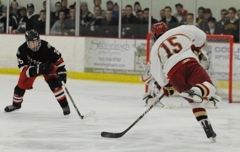 Senior forward Dylan Steman, who scored the lone Crimson goal, echoed his coach’s thoughts. The crowd wasn’t as supportive however to the Duluth East players, who were booed when they took warmups. Even getting to the ice was a struggle because the location of the Greyhounds' locker room had them walking through rows of fans. Even though it was hostile territory, Randolph didn’t seem bothered by the noise, netting two goals and adding an assist. To Randolph, deflating the crowd was a little victory on top of the actual win. “They were louder than ever when we were playing, but after we scored it was a lot of fun to listen to them quiet down, and they didn’t say anything. It was just a fun game." 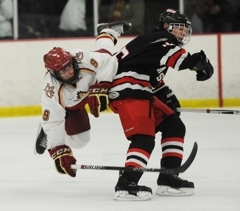 Senior forward and likely Mr. Hockey finalist Jake Randolph scored twice and added an assist as No. 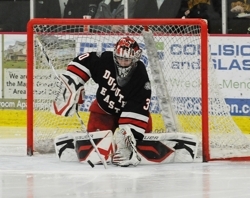 1-ranked Duluth East knocked No. 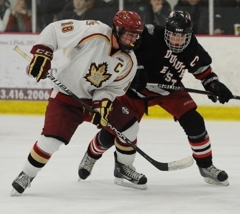 2 Maple Grove from the unbeaten ranks with a 4-1 victory on Wednesday, Jan. 4, at a sold-out Maple Grove Community Center. A crowd estimated at more than 1,500 -- with some fans standing on benches, ladders and window wells -- packed the arena to see the much anticipated showdown between two of the state’s last unbeaten teams. Randolph scored his first goal in the opening period on a backhander while kneeling on the ice. 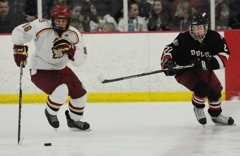 His second goal came in the third period on a nifty deke that pulled Maple Grove goaltender Kyle Koop out of position, allowing Randolph to deposit the puck into an empty net. That goal, which came on a power play, put the Greyhounds (12-0-0) ahead 4-1 with 12, minutes 47 seconds left in the third period. Dom Toninato and Conner Valesano also scored for the Greyhounds, who led 2-1 after the first and 3-1 heading into the third. 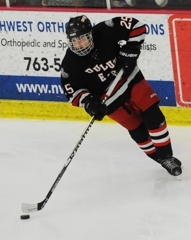 Senior forward Dylan Steman scored the lone goal for the Crimson (11-1-1). 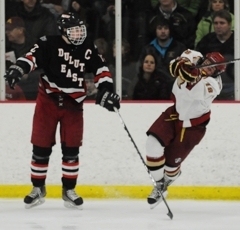 Duluth East handed No. 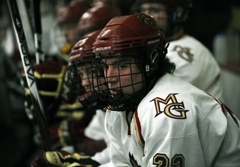 3-ranked Minnetonka its only loss of the season in the championship game of the Schwan Cup Gold Division on Dec. 28. 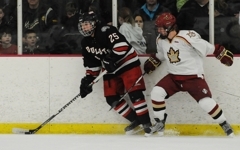 Not even heavy attention from the Maple Grove defense could slow down the Greyhounds' leading point scorer as Randolph collected three points (two goals and one assist). 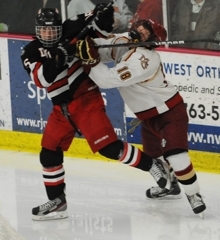 After Maple Grove's Dylan Steman tied the game at the 8:56 mark of the first period, Randolph answered by scoring his first goal just 69 seconds later. The senior forward added a nifty power-play goal early in the third period to help seal the victory. Dominant on both sides of the ice, Toninato was an all-over threat. Offensively, the senior forward had a busy first period as he scored a power-play goal and added an assist on Jake Randolph's eventual game-winning goal. Toninato also aided the short-staffed Greyhounds' defense (star defenseman Nate Repensky is out with a wrist injury) with tenacious forechecking and heavy backchecking -- notably in the second period as he broke up a quality chance for Maple Grove when it looked like the Crimson would get back into the game. 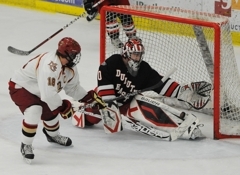 Thanks to his teammates breaking up chances and blocking shots, Parker only saw 24 shots on goal -- but they were the best Maple Grove could throw at the junior goaltender. The majority of Parker's 23 saves came when Maple Grove was on the power play or had odd-man rushes. Parker's positioning was near-perfect, making save after save that continually frustrated the dangerous Maple Grove forwards.